I’m sitting here in Starbucks today writing and watching the snow fall outside the window. I’m surrounded by a few other people who are working on their computers, and I’m sipping some tea. I should be relaxed, but I’m a little stressed. To be blunt, I’ve gotten off track financially, and I want my freedom back. After all, the freedom to be here working by myself today didn’t come easily, and I feel like I’m still clawing and grabbing and fighting to make sure I can come back and do this tomorrow. As of January 1 of this year, I’ve been self employed 3 years. Aside from raising twins, owning my own business has been the single most challenging adventure of my life. And you know what? I honestly didn’t expect it to be like this. You see, actually running my business isn’t challenging in itself. I get paid to write mostly, and I enjoy writing. So, that’s not necessarily hard. I don’t mind sending invoices and doing my accounting. I even like talking to brands and trying to negotiate some partnerships. The things that turned out to be the hardest are the emotional aspects of running my business. There is so much doubt, so much anxiety, and so much pressure. Sometimes it feels crushing, like if I think about it too much, I can’t breathe. I constantly run my numbers to make sure I have enough clients and enough income coming in. I constantly block myself from Facebook so I don’t get inundated with Facebook ads or try to compare myself to other people. I struggle with focus. I struggle with exhaustion, both mental and physical, after taking care of twin toddlers who need me during the day and more importantly, at night when they wake up crying from nightmares or something else. Sometimes I have imposter syndrome and feel like someone is going to just call me out to be a fraud because although I’m employed as a personal finance expert today, that wasn’t always the case. After all, I used to be a park ranger for the National Park Service making less than $25,000 per year. I have an undergraduate degree and a master’s degree in American History. I had no idea my life would take the path it did. About 6 years ago, my husband got accepted to medical school on the Caribbean island of Grenada. I decided to quit my park ranger job and go with him. I arrived on that island in the middle of nowhere with $6,000 of credit card debt and $39,000 in student loans. I had no job, no work visa, and lots of bills to pay. It was terrifying and exhilarating, and it gave me the kick in the pants I needed to really pursue my writing career. While my husband studied late into the night, I sat next to him and wrote and wrote and wrote. I took a writing course. I pitched clients over and over and over again until one client became two which became five which became ten and so on and so forth. When a job opened at the university in Grenada for a part time writing instructor, I applied for it and got it, which took care of my work visa issue. That part time job turned into a full time job at the university, and at the same time I was working full time, my part time writing business started to take off. I was working 80 hour weeks and hustling, and I was on fire. I felt amazing. All the excess income allowed me to pay off my credit card debt and make large payments to my student loans bringing the balance down to $33,000. Because we were on an island, again in the middle of nowhere, we never bought anything except food. We stayed on a strict cash budget and we built up our savings significantly, which allowed us to save around $10,000 cash before our twins came. We were even able to send back some of my husband’s student loans because I was able to support us. Now, several years later, I find myself again struggling with some day to day financial issues even though my annual income is way, way, way higher than it was back then. For the first time in years, I have a balance on my credit card, which makes me so mad at myself. I’m not even going to give you excuses about this because I hate excuses. My emergency fund is depleted after having back to back car repairs one last month and one this month. My husband’s hundreds of thousands of dollars in medical school loans are due, and every time I look at the balance, my chest tightens. I’m saving for so many things at once, I’m not sure where to allocate extra cash. I am saving for my kids, for another car in case our really old car dies, to fix an insulation issue in my attic, and the list goes on. Plus, I’m a little scared to learn how much I have to pay in taxes this year and am worried I’ll have to liquidate some of my Apple stock and mutual funds to come up with the cash to pay it. In January, 3 of my 7 clients put their writers on pause while they worked out some budget issues and went under new leadership. In January, I earned about $3,000 less than I was expecting. Oh and just yesterday, I got a stupid $250 water bill in the mail that I wasn’t ready for. Well, because I feel like it’s my job to be transparent and honest and to show you that I struggle too. Yes I’ve learned a lot about money over the past few years. Yes, Good Morning America called me a family finance expert. Yes, I have a better handle on finances and investments than most. But, what I’m learning now is that the path of my family finances isn’t as exponential as I thought it would be. I just assumed that over the years our income would grow and everything would just get better and better. What I’m realizing though, is that the overall state of our financial wellness will take some dips and turns. My confidence in my business will take some dips. My health will take some dips. Life will happen with house repairs and car repairs and kids having to go to the doctor. I’m sitting here remembering the tenacity I had back when I was broke and living on the island in Grenada, and it was honestly such a good time in my life. I felt so successful and so motivated. Every time I made even $10 it felt like a huge win. I realize I’ve gotten a little comfortable the past year or two, enjoying my high income and not having to work 40-50 hours a week. I realize I can do a lot better, especially with as much financial knowledge as I have now. I can also do a lot better with my accountability, my focus, and my motivational levels. I know I need to adjust and pull back in some areas and also push forward to make more income too to make up the difference. Track every single expense on Personal Capital (it’s free) and look at it every few days, so I know exactly where my money is going. Use the Change app on my phone (also free) to have a built in accountability with my purchases. Read Ruth Soukup’s free ebook, 7 Ways to Boost Blog Income Overnight. Only buy used clothes for my children as needed and none for me. You can see my secret for getting the kiddos really nice clothes for less here. Start tracking goals using the free goal setting workbook for bloggers. Having family budget meetings once a month so the Hubs knows what going on and can help me with the pressure I feel to get this sorted out. Start selling all the things. I’ve already earned over $400 selling baby items, and I’m not done yet! How are you doing with your finances right now? Better or worse than before? Have you ever been doing great and then slipped back into debt like I did? What are some of the ways you keep track of your spending and financial health? What a great and inspiring story! Kuddos to you for being able to overcome the mess you were in. Sounds pretty cool living on an island while you cleaned that up. I cant think of anywhere else I’d want to get my finances in order. Haha, thats usually where people end up after they clean up their finances!! This is so inspiring! I love your story. Financial wellness to me means being free of debt, so I can pursue travel and worry less. Yours is a great story, Cat. Looking forward to meeting you tonight! 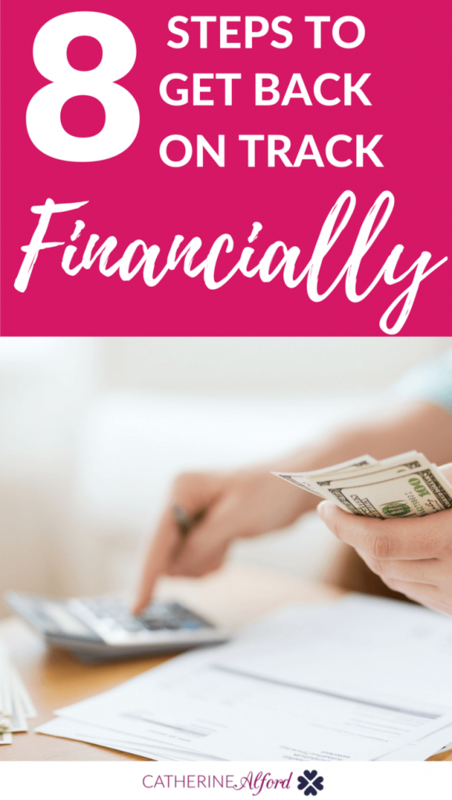 This is a great recap of your financial journey! I’ve only just started reading this blog so I appreciate the quick catch up. Good luck! Love spreading the word of financial literacy, wellness! Thanks for sharing your story Cat. Have fun at the talk! Your story is incredibly inspiring, because it’s actually one that so many of us can relate to. Keep up the great work!! Yay! Good luck! Will there be a YouTube video of the talk that we can check out after? What a powerful story of change. I like how your story is so tied to your family. Financial decisions don’t happen in a vacuum. There are other people involved and they may “complicate” matters but that’s okay because life is about people, not money. Making good choices in the midst of messy real life has a lot more to do with financial wellness than achieving a picture-perfect financial situation. . I never get tired of hearing your story. Congrats on all you’ve accomplished! Great job and thank you for the inspiration! I completely agree that freedom is our end goal not only in financial terms but complete freedom from all sorts of constraints. Rather than spending money on material things that don’t really make us happier deep down inside, it makes so much more sense to work towards financial freedom and investing in who we are and our children. Cath, Family + Finances = Freedom! Hope you get that freedom you’ve been dreaming! Good luck Cath. Great post, Cat! Your overview of your personal experience is inspiring. I know it wasn’t easy, but it had to be worth it. If you’re like me, I’m sure you couldn’t imagine working this hard at anything else. Of all the things you can buy, very few feel as good as freedom. Though a new set of sheets comes close. Hustling got you really far, that’s awesome I don’t really think I truly knew you story. I think we all have been there. Nobody is perfect and even the financial best among us have setbacks or make mistakes. Hopefully you will get back on track soon! Great (and refreshing) post! No doubt you’ll be back on track soon and crushing it. Thank you for this. My husband was laid off and got a job with a 30℅ pay cut so that hurt us, plus we had some costly home repairs. We were lucky in that we had cash savings for the repairs, but due to reduced income, we can’t replace those cash savings as fast so any future major we may need to finance. We will be paid off with our cars this year which will help us save that money towards future repairs. But we do have to try to keep our spending in check so as to survive better on this reduced income. Also, we have stuff we could be selling too, so thank you for that inspiration! Of course – I just shipped some clothes I sold today – woo hoo! Such a great post; thanks for your brutal and inspirational honesty! I’m also working the “block Facebook to avoid comparison, conduct monthly financial meetings, and track every expense” strategy again and I feel so much better about things. We’re all in this together…keep at it, girl! Budgeting is what helped me get out of debt. It enabled me to watch every penny and expense I did so it was easy to allot budget for every category in my budget system. Thus, I managed to pay some debt bit by bit until my debt had decreased, and it was fine that it happened gradually as long as I was making progress. Love this post, Catherine! Wonderful work – check out some tips on how we can help others get back on track! Such a great article! I agree mostly with the idea of moderating your plan. We can’t predict what will happen in the future so allocating some resources in case of an uncontrollable emergency is also a great idea. Just a thought! Oh yes I should have mentioned that’s a given. I have about 3k in emergency funds!